I have Celiac. Are Jessicurl products safe for me? I have Celiac myself so I know how frustrating it can be. I’m very happy to say that we have recently become 100% gluten free certified by The Gluten-Free Certification Organization. The only potentially non-gluten free ingredient we have ever used is the hydrolyzed oat flour in the Aloeba and Too Shea conditioners. In the Fall of 2017 we switched to a certified Gluten Free version of it and have had that switch certified by The Gluten-Free Certification Organization.You will begin to see the certified Gluten Free symbol appearing on the labels in November 2017. 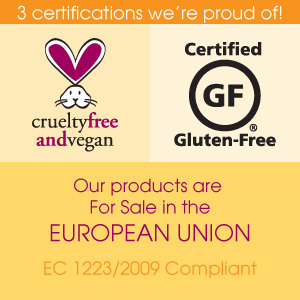 Per the requirements of the certification, we will test and submit results once per quarter to confirm that our products remain gluten-free.